Much excitement was caused in Ludwell when a monoplane and a biplane were sighted circling over the village early one Saturday morning in September. They landed in a local field and a large crowd assembled to meet the aviators. They were on their way from Salisbury to Pyt House but had lost their way in the fog, so had landed to get directions. Unfortunately because of the weather they could not see Pyt House, so headed back to Salisbury Plain. A gruesome discovery was made while workmen were digging foundations for the new Picture Palace(cinema) being built on the High Street. They unearthed a complete adult skeleton, which was probably a medieval burial in the graveyard of St Martin’s church, which once stood nearby. In August Lord and Lady Stalbridge invited all the children living in Motcombe for games and tea at Motcombe House (now Port Regis School). After singing the National Anthem all the children were given gifts before they went home. Charles Arney, an employee of the owner of The Grosvenor Hotel, Robert Borley, was found guilty of embezzlement. He was employed to convey passengers and their luggage to and from Semley Station. Each passenger journey cost one shilling (worth £4 in 2017), and the accused was keeping back some of the fares. The manager of the Gas Works gave evidence, and Arney was fined £1 and 14/6d costs. A serious accident took place when Charles Joliffe was taking milk from Barton Hill Farm, Shaftesbury to the Prideaux Milk Factory in Motcombe. His horse took fright and galloped furiously through Motcombe village and tried to go through the factory gate. A wheel caught in the factory gate post, and the milk cart overturned. Dr Harris examined Mr Joliffe who was taken to the Shaftesbury hospital in one of Mr Prideaux’s motor cars. 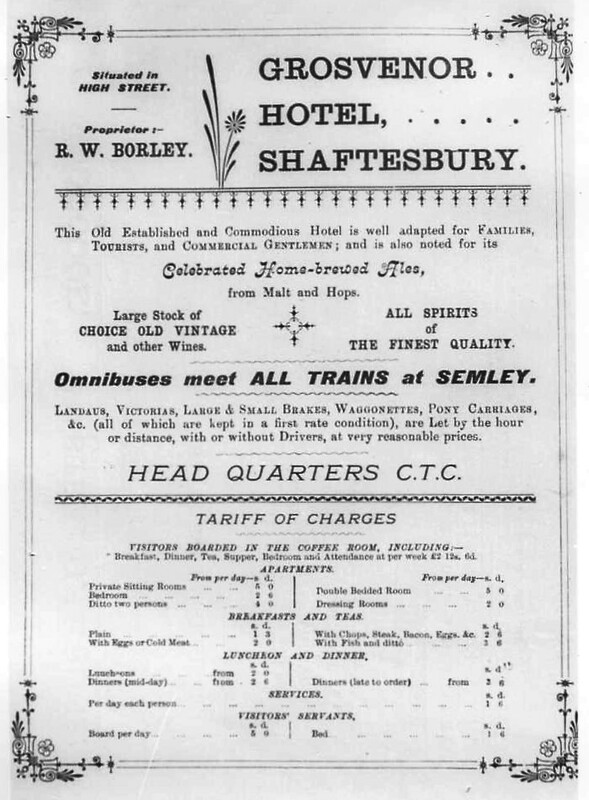 In August, Robert Gutsell took out a series of advertisements in the Western Gazette. He had recently taken over a drapery business in the High Street, which was being boycotted because of rumours claiming that he was German. The rumours were completely untrue, as Mr Gutsell and his forebears had all been born in England and were well known in Dorchester. Lord Stalbridge offered Castle Hill as a recreation ground to the town council for a rent of £40 per annum. The offer was accepted by the council. The fee for visiting the Abbey excavations was reduced from one shilling to sixpence for local visitors. John Jeffery, the market auctioneer, was given permission to build a pound with removable posts in the town market. The Mid-Wessex Rainfall Association reported that 1915 had been an unusual year, with low rainfall in May and June, and very heavy rainfall from July to October, and a very cold November. It was suggested that the unusual weather patterns in the south of England might be connected to the ‘heavy firing of the war’. The coldest and wettest March in over 20 years marked 1916, with snow or sleet on seventeen days. Crops were slow to germinate and grow, causing food shortages later in the year. On a happier note, in June, Miss Edith Rutter, daughter of the Town Clerk of Shaftesbury, John Kingsley Rutter, married Edward Langford at the Gold Hill Institute, the meeting house for the Quakers. Later that month, cars owned by Robert Borley and Charles Prideaux collided near the girls’ high school on Parsons Pool. No one was hurt even though the three occupants of Mr Prideaux’s car were thrown out, but Mr Borley’s car was badly damaged. In August in a house on the High Street, Mrs Hussey accidentally set fire to a curtain with a candle. The fire brigade was summoned, but by the time they arrived, P.C. Day and helpful neighbours had almost put the fire out. On June 29th a spectacular thunderstorm and exceptionally heavy rain caused the lake at Stourhead to burst its banks, destroying Gasper Bridge and Mill and sweeping down the Stour Valley towards Bourton, Penselwood, Silton, and Gillingham. It caused enormous damage, completely destroying Bourton Foundry which had for decades been an important engineering company, and had been manufacturing grenades, or Mills bombs, for the war effort. Heavy machinery and lorries were carried downstream, and 200-300 tons of coal ‘disappeared’. 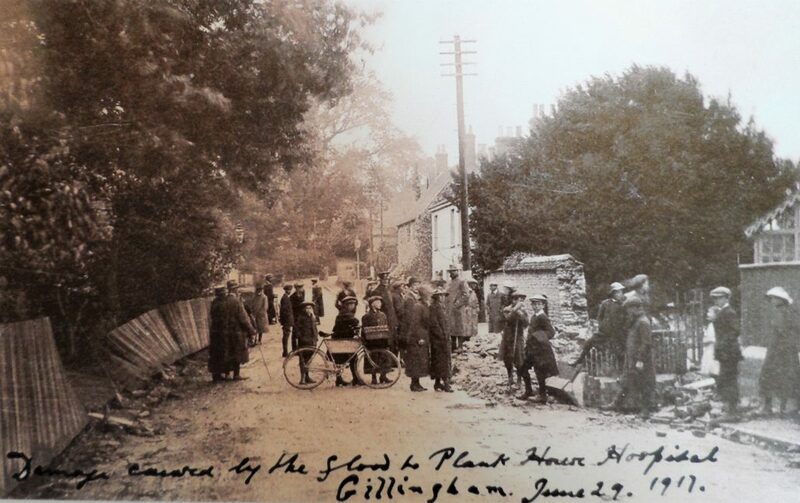 Many houses and businesses were flooded to a depth of a metre or more, and the Red Cross hospital at Plank House, Gillingham was overwhelmed. Flood water rushed through the building at waist height and only with great difficulty were patients evacuated through the windows. Immediately afterwards relief committees were set up and made appeals for help for those who had lost their homes, businesses and employment. In August Sir Richard Glyn died, aged 87 years. After an illustrious military career, he became High Sheriff of Dorset, and served as a justice of the peace and magistrate, retiring only in 1916 aged 85. He represented Fontmell Magna, where he was Lord of the Manor and chief landowner, on Dorset County Council. He was Master of the Blackmore Vale hounds for 19 years. He was a generous benefactor, supporting Wimborne Cottage Hospital and Wimborne Grammar School, as well as the schools at Fontmell Magna, Melbury Abbas, Cann, and Compton Abbas. He also promoted gardening, holding shows, awarding prizes and giving away seed potatoes. Sir Richard offered a site on Melbury Hill for the golf club, which was formed in July 1914. Sir Richard’s heir, Captain Richard Glyn was on active service when his father died. The most important piece of news in 1918 was the sale of the town in September to a Mr White, and its subsequent rapid re-sale for £80,000 to ‘The Syndicate’, three local men: Robert Borley, owner of the Grosvenor Hotel; Dr Harris; and Mr Viney, manager of Stratton, Sons and Mead, a large grocery firm. The town council had been unable to raise the £75,000 or more needed to outbid Mr White, so The Syndicate was formed to keep the town in local hands. 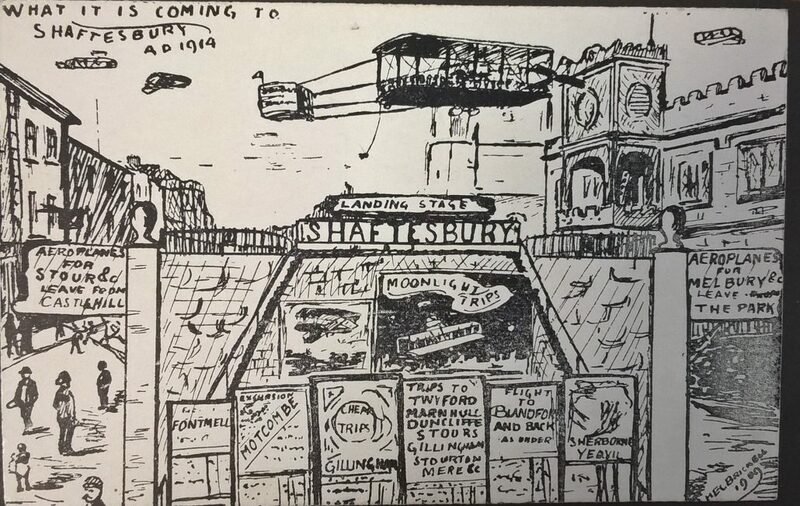 The sale of the town was the most significant event in Shaftesbury in the early 20th century, in some ways having more long-term impact than the Great War itself. On May 28th and 29th, The Syndicate put the town up for sale again, in 300 or so lots. There was an agreement amongst tenants that they would only bid for their own property, and for the most part, this worked very well. In July the Glyn estate was also sold, comprising 5,550 acres, and including the parishes of Cann, Donhead St Mary, Melbury Abbas, Compton Abbas, Margaret Marsh, Marnhull and East Orchard.